These never-worn (except for these pictures) 96% cotton and 4% spandex (the gray panels are 90% cotton and 10% spandex) pants are by Motherhood and were made in the USA. 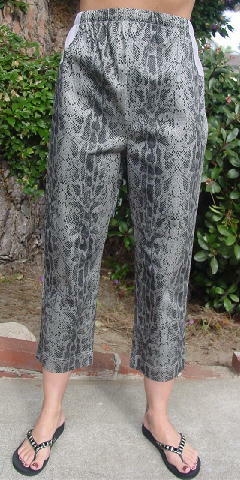 The waist area has a 1" wide elastic band and light gray side stretch areas. 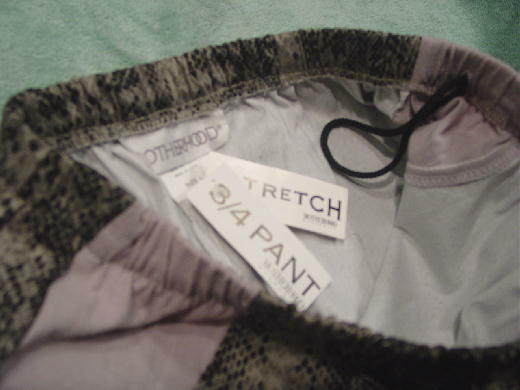 The manufacturer's tags are still attached (one tag says 3/4 pant and the other says stretch) and the interior has a black cord drawstring on one side. 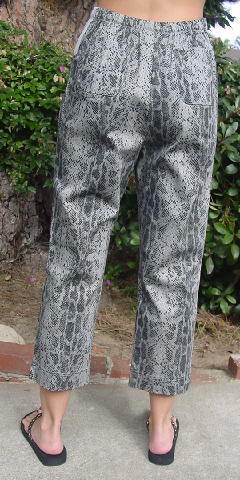 There is a snakeskin design print in grays and black. The tag says L, but they fit like a size M.
The back has two open pockets and the front center is 1 1/2" higher than the back. The leg outer side seam has 1 1/2" bottom slits.